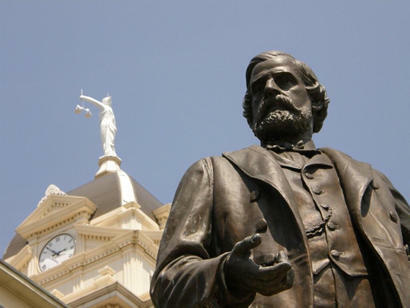 The larger-than-life bronze statue of Peter Bell stands on the SW corner of the Bell County Courthouse at Belton. The sculptor was Bulgarian-born Agop M. Agopoff. The statue was one of 14 erected by the Commission of Control for the 1936 Texas Centennial Celebrations. He may have been born in Pennsyvania and died in North Carolina, but in-between those two dates, Peter Bell spent a full life in Texas. He arrived in Texas in time to participate in the Battle of San Jacinto as a private in the cavalry. His first public office was that of Assistant Adjutant General (1837) and then Inspector General (1839). He joined the Texas Rangers to serve under John Coffee Hays in 1840. Two years later he joined the Somervell expedition holding the rank of Major. He became a captain of rangers in 1845 but when the war with Mexico began, he resigned and joined the U. S. Army. Bell was lauded for his actions at the battle of Buena Vista and was promoted to Lt. Colonel. After the war he oversaw a battalion of Hays's Ranger regiment, which was stationed along the Rio Grande and the Nueces Strip. Bell was elected governor of Texas for two terms, beginning in 1849 and resigned just a few months before his term expired to fill a vacancy in the U.S. Congress created by the death of David Kaufman (yet another Texan who had a county named after him). Bell married the daughter of a North Carolina planter in March of 1857 and moved to his wife's estate. He was offered a commission as colonel in the Confederate Army at the start of the Civil War but declined the honor to manage his wife's plantation. 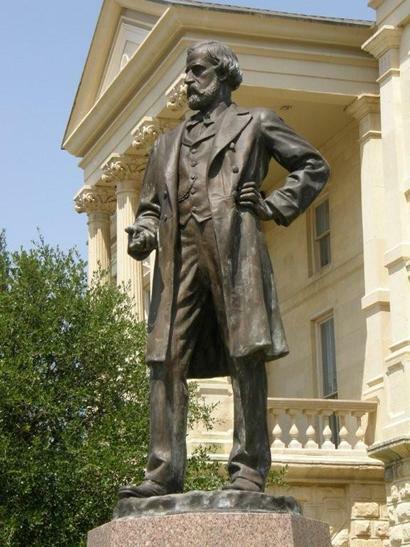 In the 1890s, Bell was honored by Texas by having Bell County named after him and was given a pension. Upon his death in 1898, he was initially buried in North Carolina, but as a former Governor of Texas, the bodies of both he and his wife were exhumed and reinterred in the State Cemetery at Austin in 1930 to join other illustrious Texans on "Governor's Hill." 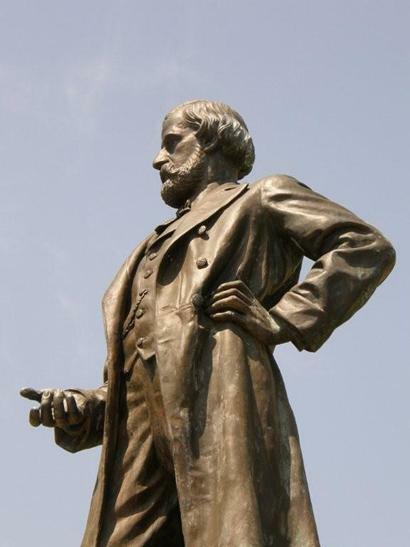 The statue of Peter Bell was erected on the grounds of the Bell County courthouse in 1936 as part of the Texas Centennial celebration.